On-loan Barcelona striker Arda Turan has received a record 16-match ban in Turkey after pushing a linesman in a moment of madness at the weekend. Turan, 31, was released to Superlig side Basaksehir in January in a two-and-a-half season temporary deal having failed to impress at Camp Nou since moving from Atletico Madrid in 2016. Signed to reinforce the Istanbul club in their bid for their first title in their history, he has made a total of 11 appearances to date, scoring on two occasions. But in a 1-1 draw against Sivasspor Turan became incensed at the failure to award a foul, and channelled his rage at a linesman. The player remonstrated furiously with the official, before shoving him and walking away. Unsurprisingly he was immediately issued a red card, and and the Turkish FA’s disciplinary board have backed the decision by handing down the longest ban in the nation’s football history. 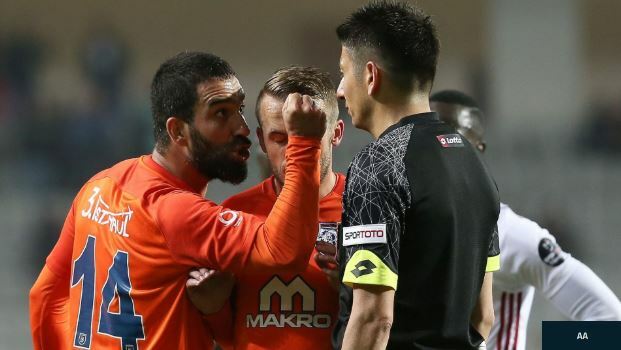 Arda’s ban means that he will miss Basaksehir’s last two games of the 2017-18 season, with the club trailing leaders Galatasaray by two points. He will additionally be barred from playing the first 14 games of 2018-19, almost half of the campaign. Basaksehir’s coach Abdullah Avci had nevertheless defended his wayward star in the aftermath of the incident. “These things are part of the game. We can’t be bothered by the thoughts of those who write on social media, people that we don’t even know,” Avci fired when questioned by reporters after the game. It is not the first time Arda has attracted controversy since moving back to his native Turkey. In March the player threatened to “crush” a journalist’s head and eyes when he and his wife were interrupted at dinner by the reporter’s questions.